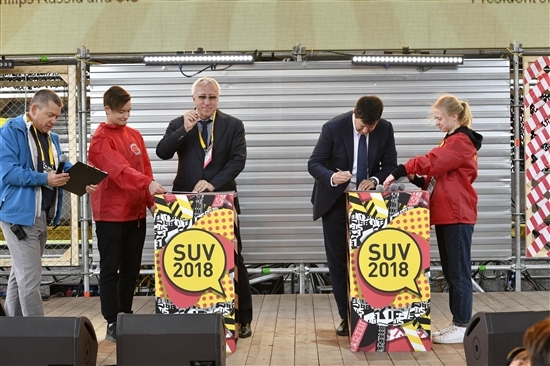 The annual Skolkovo Startup Village kicked off with two signing ceremonies and various jokes about the chilly weather on Thursday as startups, investors and major tech figures from all around the world gathered at the Skolkovo innovation city for Eastern Europe’s biggest tech conference and exhibition. The Startup Village attracts tech entrepeneurs, investors and dragons from all over the world. Photo: Sk.ru. Following a morning session with the famed Russian film director, producer and actor Fyodor Bondarchuk and a panel discussion devoted to artificial intelligence, Skolkovo Foundation president Victor Vekselberg welcomed those present to the sixth annual Startup Village. “When we began to do this, there was nothing here, there were cows walking around here,” he recalled, referring to the greenfield site outside Moscow on which the innovation city is being built. “But there were people who believed in it, and many of them are here today, including you. The topic of our fantastic meet-up today is, as is traditional, the future. It is you who formulates the future, who predicts it, who forges it with your hands and minds. Our task is to help you in this, to make it more effective, fast, interesting and meaningful,” said Vekselberg. 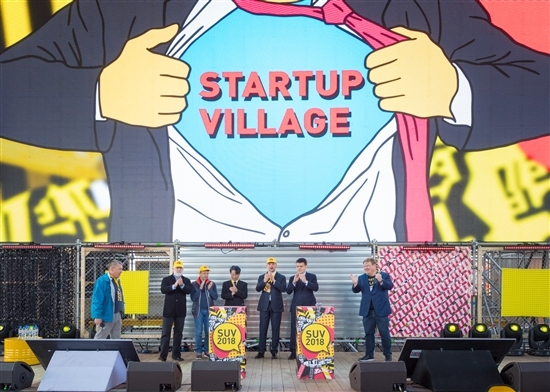 The Startup Village brings together about 20,000 entrepreneurs, scientists, inventors, tech experts and business angels with the aim of helping startups to find new partners, investors and mentors. The event includes a competition for startups and tech projects, as well as an extensive Startup Bazaar: an exhibition of tech innovations from all over the world, including Skolkovo residents. Joining Vekselberg on stage for the opening were Arkady Dvorkovich, co-chair of the Skolkovo Foundation council; Pekka Viljakainen, a Finnish entrepreneur and advisor to Vekselberg; the Japanese ambassador to Russia, Toyohisa Kozuki; newly appointed Science and Higher Education Minister Mikhail Kotyukov; and Deputy Prime Minister Maxim Akimov, who is responsible for innovations within the government. Dvorkovich wished the innovators luck at the two-day open-air event. “You can become a new page in history. We want to help you and accompany you on that journey,” he told the audience of startups. As the Startup Village's official partner country, Japan has its own pavilion at the event. Photo: Sk.ru. Kozuki invited those present to visit the Japanese pavilion at the Startup Village. Japan is the official partner country of this year’s event, and 2018 has been designated the Year of Russia in Japan and vice versa. More than 300 joint events will take place as part of the year-long cultural exchange, which was officially launched on May 26 at Moscow’s Bolshoi Theatre in the presence of Russian President Vladimir Putin and Japanese Prime Minister Shinzo Abe, noted Kozuki. “Cooperation between Japan and Russia is varied: in culture, economics and politics,” said the ambassador. Argentinian minister Lino Barañao (left) shakes hands on the MOU with Skolkovo's Igor Drozdov. Photo: Sk.ru. Two agreements were signed ahead of the opening ceremony: one between the Skolkovo Institute of Science and Technology (Skoltech) and Dutch tech giant Philips, on uniting efforts to develop the medicine of the future. Maxim Kuznetsov, CEO of Philips in Russia and the CIS, who signed the agreement on behalf of Philips, noted that at last year’s Startup Village, the corporation had opened a lab at the Skolkovo innovation centre. “We’re very glad to develop our cooperation with Skoltech,” he said. Skoltech president Alexander Kuleshov (left) signs the agreement with Philips' Maxim Kuznetsov. Photo: Sk.ru. 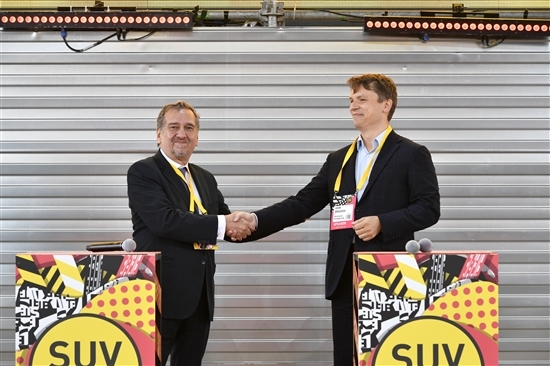 The other agreement was a memorandum of understanding between the Skolkovo Foundation and Argentina’s Ministry of Science, Technology and Productive Innovation, whose head Lino Barañao is attending the Startup Village. The minister noted that Russia had made a great contribution to Argentinian culture, with generations of Argentinian children growing up with Russian films, books and music. “Now it’s time to work together on technology to insure a cloudless future for us all,” said Barañao. Skolkovo Foundation chairman of the board Igor Drozdov, who signed the agreement on behalf of Skolkovo, said he was pleased to see the number of countries with which Skolkovo works expanding, and added that he hoped to see Argentinian companies taking part in next year’s Startup Village.